Since the kickoff of the "Not In This Lifetime" tour in 2016, GUNS N' ROSES has performed an astounding 140-plus shows for over five million fans to date in stadiums, arenas, and as part of festivals worldwide. This year alone the band has played at 13 stadiums as part of their epic run along with five summer festival headlining slots across Europe. The European dates in 2018 have thrilled over 750,000 fans. Produced and promoted by Live Nation, the outing featuring one of the most legendary bands has become one of the most successful tours of all time. 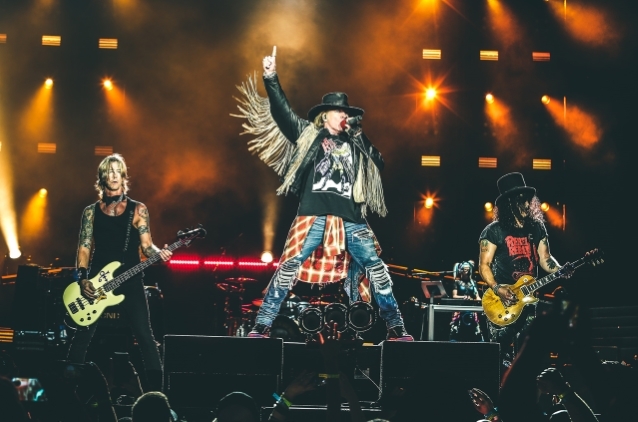 GUNS N' ROSES continues to take the world by storm as it continues another round of highly anticipated "Not In This Lifetime" tour dates this week. On Saturday, November 3, the band performed at the Mother Of All festival in Monterrey, Mexico and is continuing its trek with stops in Jakarta, Manila, Hong Kong, Abu Dhabi, Johannesburg, and more throughout the month of November. The Southern California band will also rock the paradise city of Honolulu on its only U.S. date of 2018 — and its first show ever to take place in the state of Hawaii. One of the most ambitious tours in rock and roll history will play for thousands of fans at Aloha Stadium on Saturday, December 8. Three-fifths of the classic GUNS lineup reunited in 2016 after last performing together more than two decades earlier. The "Not In This Lifetime" tour, which is now one of the highest-grossing in music history, launched in April of that year with a nightclub gig in Los Angeles and shows no signs of stopping. Joining singer Axl Rose and guitarist Slash on the "Not In This Lifetime" trek are bassist Duff McKagan, drummer Frank Ferrer, keyboardist Dizzy Reed, guitarist Richard Fortus and second keyboardist Melissa Reese.